The moment when you realise your first baby won't be your only baby anymore is special. It is fun and exciting but can also be filled with trepidation as both you and your first born adjust to a new person in your group. That moment has just been captured perfectly by Portland-based birth photographer Laura Paulescu. The image is of a mother giving her firstborn a big hug goodbye before the little girl has to leave the delivery room so her mum can give birth to her new brother or sister. 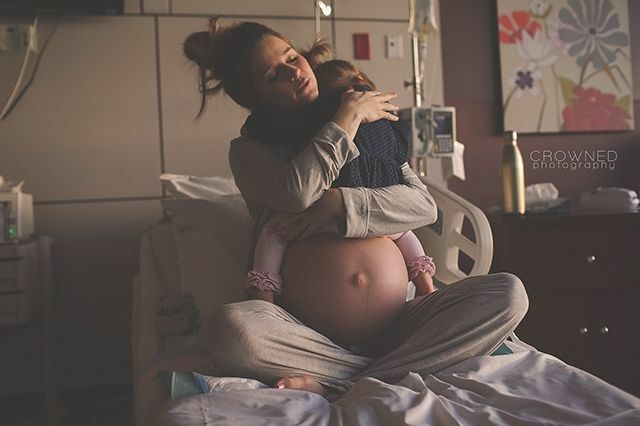 The dynamics of their relationship is about to change and the birth of a second child can be a real bittersweet moment for some mothers as the special time they shared with their first child comes to an end. However, the picture also captures the remarkable strength of the mother holding her daughter and reassuring her that everything is going to be just fine.